Batley's Dane Manning is held up by the York defence during Sunday's Yorkshire Cup semi-final. 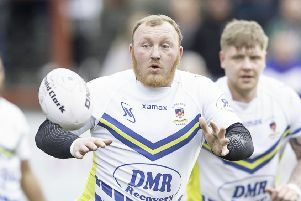 Batley Bulldogs coach Matt Diskin was pleased with his side’s performance in last Sunday’s Yorkshire Cup semi-final victory over York but believes there is still plenty of room for improvement before the start of the Championship season. Batley battled back from 18-0 down to seal a 22-18 victory, which sets up a cup final against Bradford Bulls at Mount Pleasant this Sunday (kick off 2pm). Diskin was impressed with the quality on show from both sides and said: “If you were fortunate to watch as a neutral, I thought you saw a really good game of rugby. “From our point of view, we did some really good things but there are areas for improvement. “York, late in the first half, exposed a couple of frailties we have got in and around the ruck areas which we need to tidy up. For us to concede tries from the ruck is something that is not acceptable. Batley repelled York for long periods of the first half, when the Knights played down the slope and with a strong wind at their backs, only to concede back-to-back tries in the build up to half-time. Diskin added: “It wasn’t a fatigue element it was literally concentration when mistakes were made and we will work hard to correct it. “It was individual lapses in concentration but we will address it and if teams are going to score tries against us, we make them earn it because those two tries were too easy for them. “I thought with ball in hand, we scored a couple of decent tries. It was a bit scrappy and the elements didn’t help. Bradford booked their place in Sunday’s final thanks to a hard-fought 20-18 success over Dewsbury Rams last Saturday.